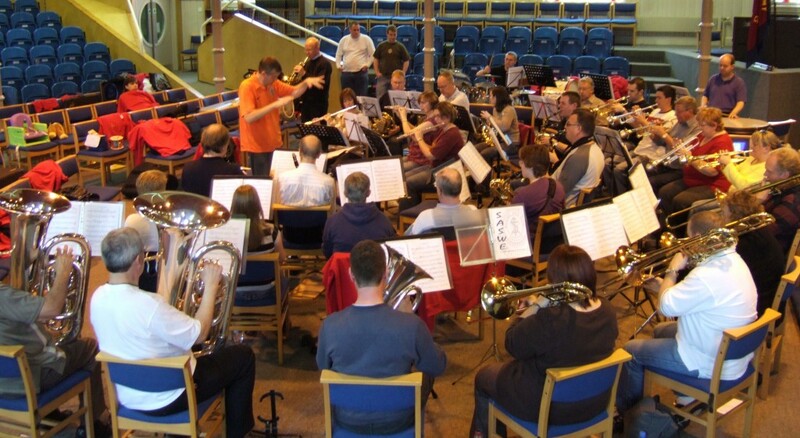 The idea of a Salvation Army Wind Band was first discussed by John Davie and Alan Laken when they met in November 1993 at the American School in London. The occasion was an event organised by the ‘British Association of Symphonic Bands and Wind Ensembles’ when John was the chairman of the London and Home Counties Committee and Alan was conducting his youth band from the Redbridge Music Centre. The two of them had met many years previously when an attempt had been made to set up a Salvation Army Wind Quintet i.e. flute, oboe, clarinet, horn and bassoon at the Regent Hall Corps. The following year John met Andrew Mackereth when they were both performing with the Wind Ensemble at the Salvation Army Music Leader’s Festival, Royal Albert Hall, London. As a result of this meeting John immediately recognised Andrew’s talent and invited him to be part of the proposed venture. This proved successful especially with the musical partnership of Alan and Andrew and subsequently they became firm friends. It was felt that the group should have a chaplain and this post was filled admirably for two years by Andrew Stewart. From 1996 this position has been filled most successfully by Peter Bale who has been the Principal Alto Saxophonist with the group.The group was formed out of a desire by Salvationist woodwind instrumentalists to perform within a Salvation Army environment. The repertoire mostly consists of original works, including many written by our resident composers Andrew Mackereth, Alan Laken and Michael Babb. Sadly for all of us Alan Laken died suddenly in October 2002, but thankfully his music still lives on and is a constant reminder of the great contribution he made to this group. SASWE personnel is made up of Salvationists, adherents and friends from other Christian denominations and meets three times a year, has approximately a three hour rehearsal before presenting a festival the same evening. Corps which have been represented are: Ashington, Basingstoke, Bedlington, Birmingham Citadel, Bedford Congress Hall, Belfast Temple, Blackburn Citadel, Boston, Brighton Congress Hall, Bromley, Cambridge, Chalk Farm, Clacton, Clydebank, Coventry, Croydon, Dudley, Enfield, Felixtow, Fordingbridge, Folkstone, Hadleigh Temple, Hemel Hempstead, High Wycombe, Horsham, Ilford, Kettering, Liverpool Walton, Leeds Central, Leigh on Sea, Leighton Buzzard, Leicester Castle, Letchworth, Luton, Maidenhead, Margate, Newcastle Temple, Nuneaton, Pentre, Pill, Plymouth Congress Hall, Rayleigh, Reading, Romford, Sale, Staines, Sunderland Millfield, Sunderland Monthwearmouth, Sutton, Tunbridge Wells, Warrington, Worthing.